Toronto [ZNN] ZlandCommunications has been successful in using the Canadian Access to Information Act to obtain first-hand data from the Department of National Defence in Ottawa indicating that Canadian NORAD CF-18 jets were scrambled to intercept ‘unknown tracks’ that had entered Canadian airspace in an unauthorized manner as recently as 2001. ZlandCommunications has also been successful in obtaining Canadian government documents that indicate correspondence, internal memos and discussions by joint intelligence committees suggesting Canadian government officials were concerned about UFOs and were involved in discussing attempts to keep information from the public about UFOs. Ministers of Defence on at least two separate occasions attempted to explain government policy and activity concerning UFOs. Each of the documents below not only describes government UFO documentation, but they each specify actual ‘incidents’ demonstrating that the UFO phenomenon has been assessed, analyzed and sequestered at high levels of intelligence and military authority in Canada. WHAT SPECIFICALLY HAS ZNN UNCOVERED? ZNN has uncovered and acquired five discrete government and NORAD documents. Three of these documents originate from government archives. One document has been obtained by ZNN through the Access to Information Act. The final document is correspondence from the Hon. Peter MacKay former Canadian Minister of National Defence to the news director of ZlandCommunications. None of the following documents require authentication – as each is original. Details of the repository of over 9500 Canadian UFO related government files is available upon request. WHY IS THIS FREEDOM OF INFORMATION REQUEST BY ZNN SIGNIFICANT? As stated in Chapter 2 of the JANAP (Joint Army Navy Air Force Publication) an agreement between the US and Canada, little doubt exists that the unauthorized incursion of unidentified flying objects into Canadian airspace is of national security concern to both countries. Communication Instructions for Reporting Vital Intelligence Sightings (CIRVIS) list unidentified flying objects among the eight categories of vital intelligence to be reported. 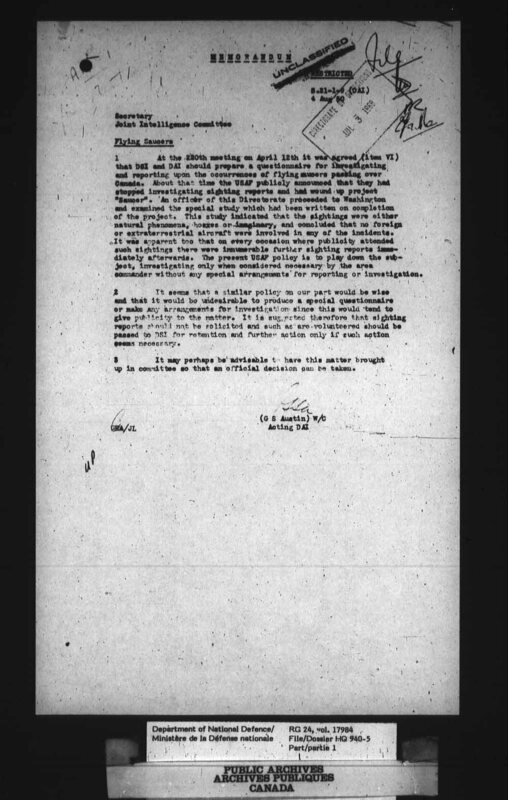 The Canadian documents listed below, in addition to the now de-classified NORAD SECRET EVENT STATUS report in the possession of ZNN, indicate the Canadian government has been and remains vitally concerned about the unauthorized incursion of unidentified flying objects within Canadian airspace – so much so that highly trained pilots, the expansive technical and radar resources of NORAD, in addition to NORAD’s most sophisticated aircraft – CF-18s – are all employed to chase and intercept unknown craft at sub-sonic speeds at 35,000 feet with little or no reported success. [Ed. Note: It is note-worthy that Minister MacKay in his correspondence to ZNN – after a less-than-thorough examination of the facts and questions submitted to him by ZNN – attempts to explain these event sightings to ZNN as migratory geese or flocks of birds. ZNN is unaware of any species of ornithoids capable of flying at 35,000 feet at over 400 to 500 mph. All of the above raises serious and unacknowledged questions. What command structure is in place to authenticate and mobilize a decision to chase UFOs? What reporting mechanisms are in place to inform or brief elected officials on these events? Why is none of this national security information ever scrutinized by media or members of the Opposition in the Canadian House of Commons? What kind of craft are able to elude NORAD’s most sophisticated aircraft? These and other questions bring into sharp focus substantial historical, on-going and covert discussions and documentation about the UFO phenomenon among Canadian government agencies – none of which has ever been openly addressed by bureaucrats, military officials or elected representatives. c) The Canadian and American governments consider these objects as authentic. d) No attempt has been made by government, NORAD or Canadian Air Force officials to inform the general public about these concerns. Conclusion: Factual evidence exists that the UFO phenomenon is of sufficient authenticity as to be of a real and on-going concern to the Canadian government and its joint NORAD operations with the USA. The second reason why this freedom of information request is significant is that it represents an initial step in raising the need for a serious, on-going and in-depth investigation into what these objects may be and why the Canadian government and its military are so reluctant to carry on an open dialogue within the House of Commons, with the media and with the citizenry of Canada. It remains the position of ZlandCommunications that the historical and on-going government documentation and military activity – both domestic and international – is sufficient evidence to launch either co-terminus or independent investigations by media and government over-sight agencies to assess shadow-government or intell-agency(s) complicity in covert operations that deny the public its democratic rights with respect to the nature of the UFO issue and extraterrestrial interaction on the planet. Finally – this freedom of information request is significant because – as seen in ZNN’s correspondence to then Minister of Defence the Hon. Peter MacKay – the Minister avoided answering 9 of the 10 questions put to him by ZNN. This lack of transparency surrounding a national security issue suggests that either Canadian government officials are totally ignorant of the facts surrounding the UFO matter or – they and the infrastructure of government and its military have something to hide with respect to the existence of UFOs. 3) Seeking answers to the 9 other questions put to the Minister in the ZNN correspondence to him. To date, the mainstream press has remained silent on this front – avoiding any in-depth investigation – despite the evidence that government agencies and the military take the UFO matter very seriously. The following documentation is submitted for consideration. The following pages are part of an 89 page set of documents that were obtained by ZNN through the AIA (Canadian Access to Information Act). The report catalogs the scrambling of 2 CF-18’s out of COMOX AFB in British Columbia Canada in 2001 to chase three ‘unknown tracks’. It should be pointed out that during this episode – a MEDVAC (LR-35 Medical Evacuation jet) was also involved in what appears to be the visual confirmation of the “unknown tracks”. CORRESPONDENCE FROM CANADIAN MoD PETER MACKAY IN RESPONSE TO QUESTIONS PUT TO HIM BY ZNN RE: ABOVE NORAD DOCUMENTS. These correspondence reflect exchanges between the office of the former MoD the Hon. Peter MacKay and ZNN about his knowledge of this incident concerning specific questions put to him by ZNN. Questions or comments may be directed to ZNN. [ZNN UPDATE Nov 29.2013] ZNN is in the process of preparing a shocking document for the press, the Canadian Minister of Defence, the Minister of Justice and leaders of the Opposition parties in the Canadian House of Commons about the NORAD SECRET Status Events Report and what CF-18 pilots actually contacted during their pursuit. After ZNN’s line by line partial review of the four page NORAD SECRET Status Events Report, the ATC NORAD log reveals stunning proof that the 2 CF-18’s involved in the pursuit of the 3 unknowns actually DID make CONTACT with one or more unknowns. This data is highly significant. This indisputable line in the NORAD log is preceded by the following line: “Time to target for CF-18s is 90 secs…”. This statement in the NORAD log clearly demonstrates the CF-18s were approaching something at 35,000 feet that was designated as an unknown track – i.e. an unauthorized incursion into Canadian airspace. a) What the NORAD CF-18s made contact with – as clearly stated in the NORAD log? b) What information within the many redacted sections of the NORAD log is responsive to indicating what the pilots may have seen? c) What type of contact – visual or otherwise was reported by the LR-35 MEDEVAC jet mentioned in the NORAD report? d) This event was clearly categorized as an unathorized incursion into Canadian airspace requiring the scrambling of 2 NORAD CF-18s. Who were the pilots, what did they come into contact with and what was the substance of any de-briefing that occurred after the 2 CF-18s returned to base? e) Will the Minister respond to questions concerning this matter on the floor of the Canadian House of Commons during regular Question Period? Since ZNN has not yet completed a full review of the NORAD ATC report, the submission of the entire briefing document to the press and members of the Canadian government remains a work in progress. There are over 150 separate lines in the NORAD report – many of which are either in ATC technical jargon or redacted. Some of the lines are in easy-to-read language. When ZNN has completed the full analysis of relevant lines in the NORAD log – the first submission of the press and to the Canadian government will be posted on EXONEWS. Any one who has additional questions or perspectives they feel may enhance the submission to the Canadian government by ZNN, is invited to submit them to ZNN. Also anyone with a technical background capable of clarifying the ATC jargon in the NORAD log is encouraged to submit their findings to ZNN at – zland@sympatico.ca. Be very cautious about viewing video or pictures of so-called UFOs on the net. Our estimation is that 90 to 95% of pictures and videos found on the net are unfortunately very unreliable – they are either mis-identifications or faked. This is one of the reasons why many in the UFO research community value government documents and high-level witness testimony over pictures and videos. If you do wish to view some pictures and videos that have a relatively high level of credibility – have a look below. Go to https://sites.google.com/site/zlandcommunications/ and scroll down to video of Fukushima orbs March 2011. Then try looking at UFO CASEBOOK. One of the finest is: http://www.ufocasebook.com/vid/lakecote.html This site will provide much interesting viewing – but again be cautious. If you wish to find out more about videos and photos that have been vetted for credibility we have a few that we can send along to you. We do not depend on video and photos to prove the case of the existence UFOs – they represent only one of the many converging lines of evidence to raise the issue in an intelligent and responsible manner. If interested – send us an e-mail at zland@sympatico.ca and we can forward some of our files to you. Thank you for your interest. V. Viggiani News Director ZNN.